One of the best of the ancient mythology series that have swept through modern numismatics in recent years, Scottsdale’s surprise entrant follows a design ethos set out with the mints epic Biblical Series. 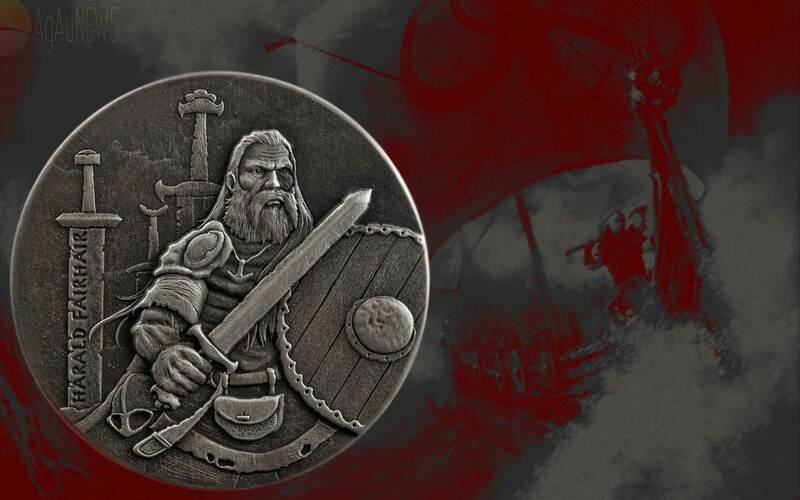 While that series will run to a huge sixty releases over the next decade, Vikings: Gods, Kings, Warriors will top out at a still impressive 15 coins. At the time of writing, the second batch of three has launched, leaving a further nine coins to appear, likely over the next three years. 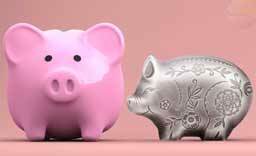 While there were initial indications that after the launch of the first trio, the coins would come out individually spread over the year, that hasn’t proven to be the case with the coins being released in threes. Unlike most series that tend to concentrate on just the gods of the old Norse tales, Vikings: GKW, like the Choice Mints Legends of Asgard series, looks at the wider Viking world. Legends takes in a far wider range of pure mythology, while Vikings: GKW leans more towards the actual historical record. Despite some overlaps, they would make fine companions to each other. The name of the series is a good indicator of its leaning. The Kings and Warriors parts are, to a large degree, historical. Like Scottsdales bible coins, this series uses a staple format of the genre, that of a 2 oz, antique-silver, high-relief design. In this case they’re also rimless, with the serial number engraved into it. Because of the high-relief nature requiring a greater thickness of metal, the diameter is similar to those of one-ounce in weight, a necessary compromise shared by pretty much all coins of this format. 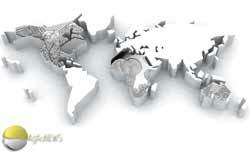 Great art design, interesting and mixed poses, these are very well implemented coins. 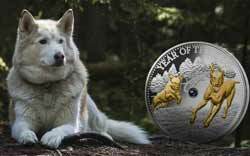 We were very impressed by last years coins when we saw them in Berlin. 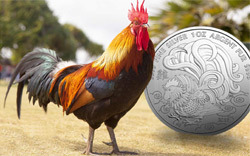 Themed and customised per coin packaging round out a superior series of coins. Odin the “Allfather” was the premier Norse deity, at once a magnetic and polarizing figure whose influence permeated all aspects of society. A lover of knowledge, he was said to have sacrificed his eye in exchange for great wisdom. He was the ruler of Valhalla, the highest level of the underworld and frequently received human sacrifices. In battle, he was a manipulative commander who derived an almost spiritual ecstasy from orchestrating violent, chaotic bloodbaths. He was also a lover of poetry and heavily involved in shamanism, magic and necromancy. 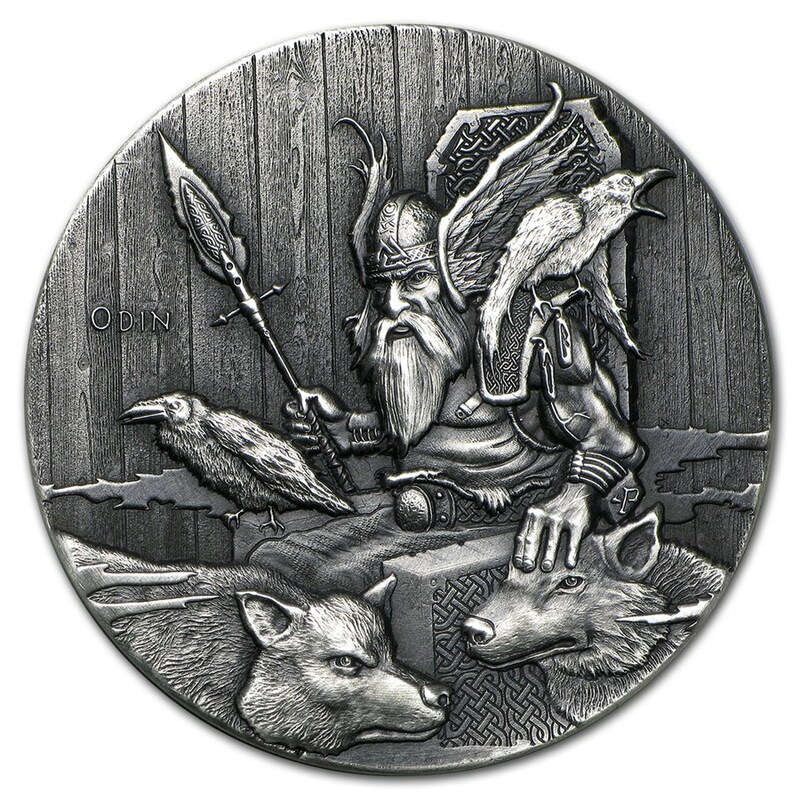 DESIGN: Features a depiction of God Odin setting on his throne, Hlidskjalf, shrouded in mist and flanked by his shamanic helpers, two ravens, Huginn and Muninn, and two wolves, Geri and Freki. The background features a wooden slat wall as his throne sits in the hall Valaskialf. 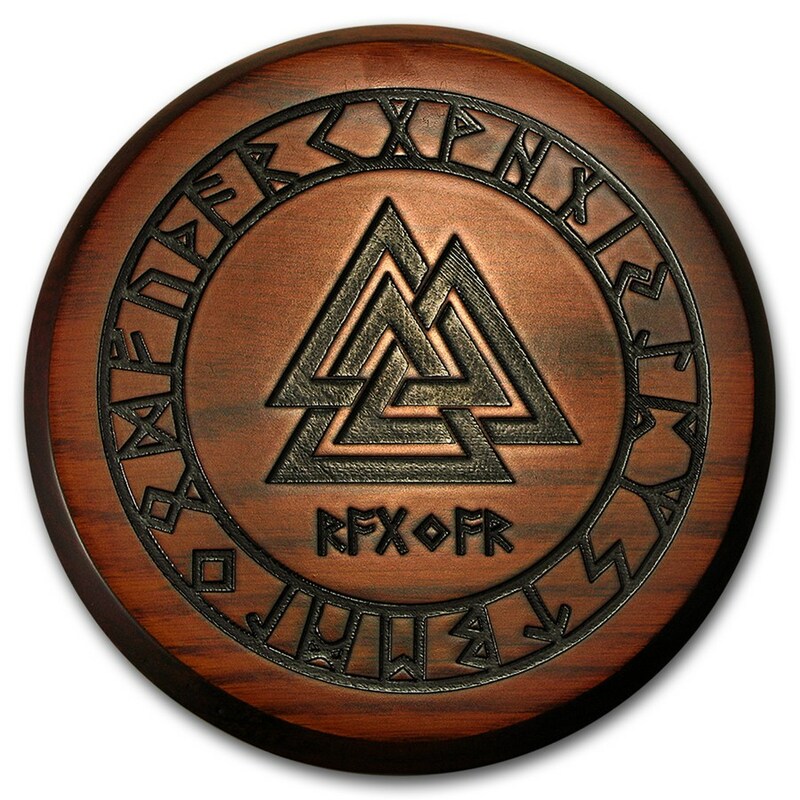 PACKAGING: Housed in a round wooden display box designed with the Triple Horn of Odin, which is three interlocked drinking horns, surrounded by the Runic alphabet. King Cnut is remembered for stabilizing England, Denmark, Norway, and parts of Sweden and unifying the regions into one empire from A.D. 1016-1035. 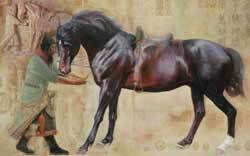 Humility was his hallmark trait, often illustrated by the tale of “King Cnut and the Waves,” wherein Cnut had his throne placed on the seashore as the tide was coming in. Sitting upon his throne, he stretched out his hand and commanded the tide to recede. The ocean responded by continuing its advance, covering the king’s feet and soaking his royal garments. Cnut turned to the small audience accompanying him and said, “Let all men know how empty and worthless is the power of kings, for there is none worthy of the name, but He whom heaven, earth, and sea obey by eternal laws.” He placed his crown upon a crucifix and never wore it again. DESIGN: Features a depiction of King Cnut wearing a crown and holding a scepter. His cloak clasp is a quatrefoil coin design, popular when Cnut was in power and the type he would have minted. Above him is “Cnut Rex Anglorum” written in Runic, which translates to “Cnut, King of England”. 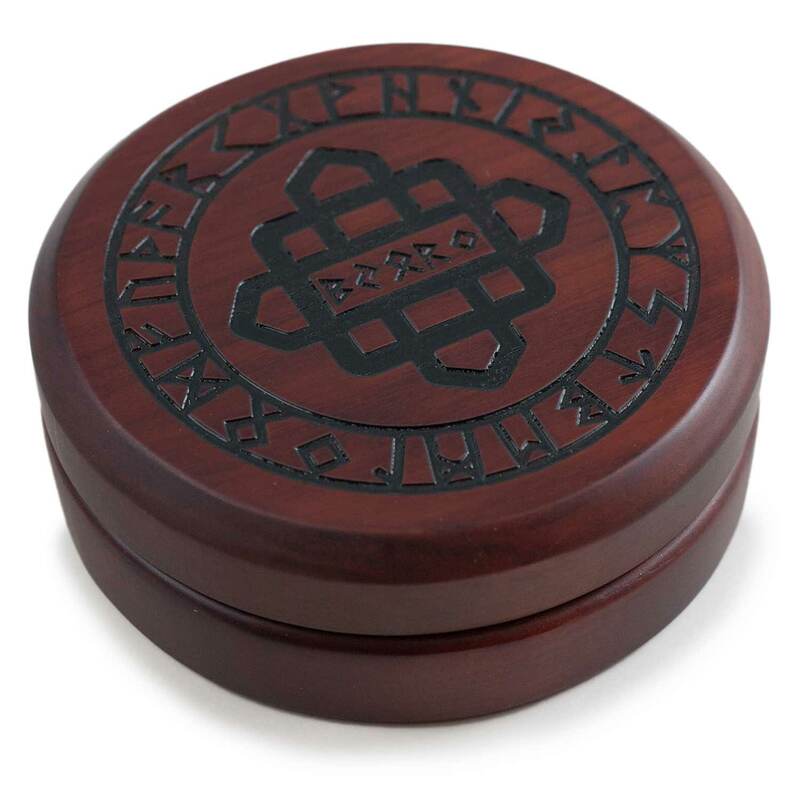 PACKAGING: Housed in a round wooden display box designed with a short cross quatrefoil, which was on the King Cnut coins minted during his reign, surrounded by the Runic alphabet. A legendary Viking warrior and king, Ragnar of Lothbrok is likely an amalgamation of several prominent warriors. He is remembered for leading successful campaigns into France and England, galvanizing Viking armies to battle, and passing on his legacy to his many warrior sons, most notably, Ivar the Boneless. He met his end when he was captured by king Aella of Northumbria and thrown into a pit of snakes. DESIGN: Features a depiction of Ragnar in 9th century Viking attire and weaponry, equipped with a Goosewing fighting axe, round shield, Nordic fox cloak, fighting sword, pouch and valknut necklace, showing his devotion to Odin. Behind him is a Celtic ring with seven rune stones spelling his name. 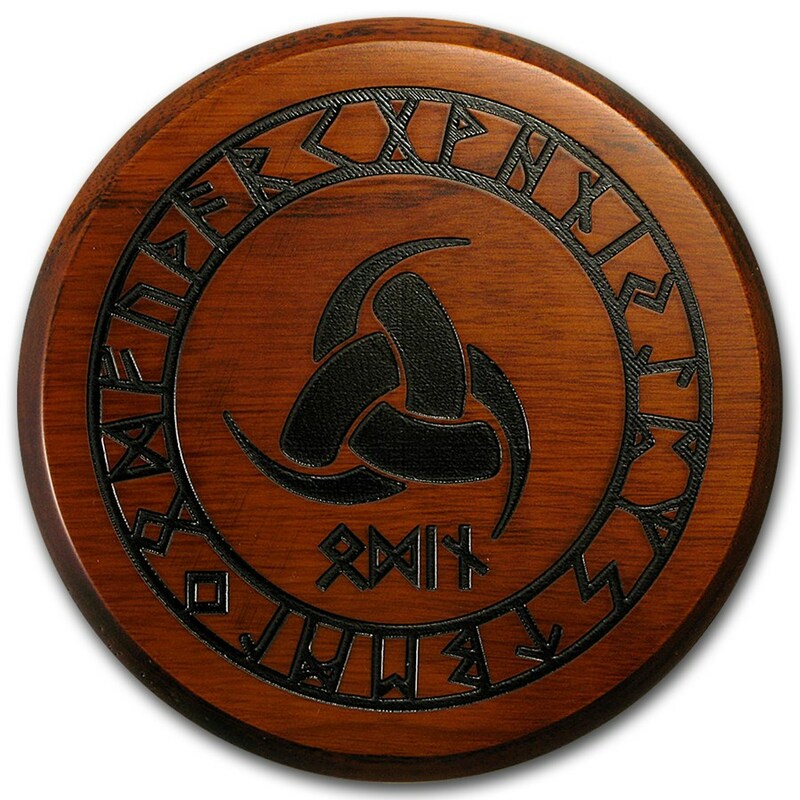 PACKAGING: Housed in a round wooden display box designed with a large valknut, comprised of three interlocking triangles standing for “Slain Warrior”, surrounded by the Runic alphabet. Thor the Norse God of Thunder and son of Odin, the Allfather. In Norse mythology, Thor is the husband of the golden-haired goddess Sif, a Goddess associated with earth and fertility. 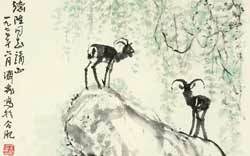 Together, they fathered the goddess Thrud. Thor is described as fierce-eyed, red-haired and red-bearded. Thor’s exploits, including his earth-shaking battles with the monstrous serpent Jormungandr and their foretold mutual deaths during the events of Ragnarok are literally the stuff of legend, having been recorded throughout numerous historical Norse poems and texts. 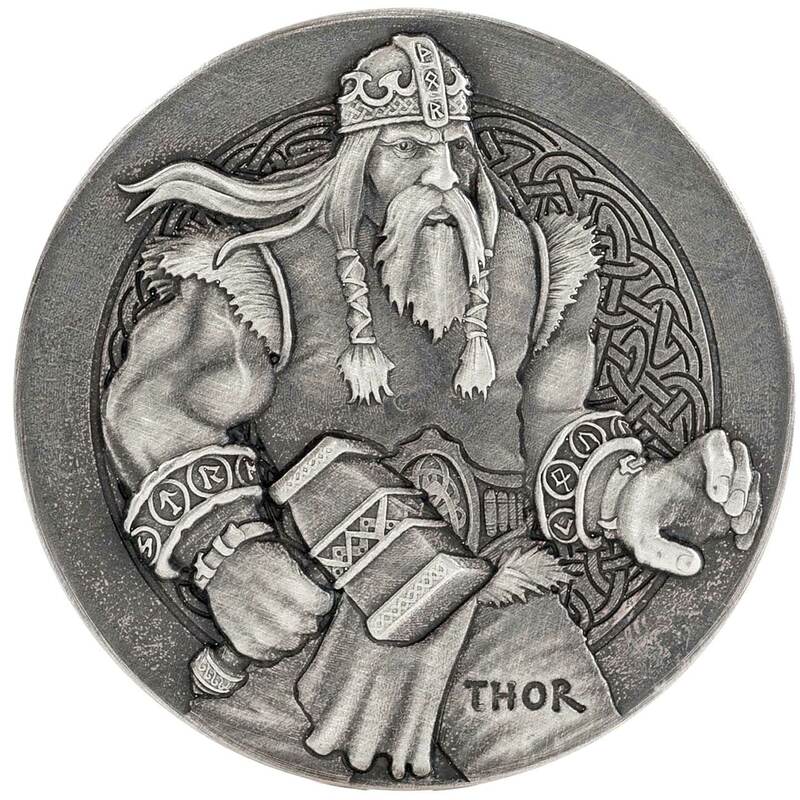 DESIGN: Depicts Thor in the foreground, standing with his hammer Mjölnir, a weapon capable of leveling mountains according to Norse mythology, with a circle of knotwork behind him. 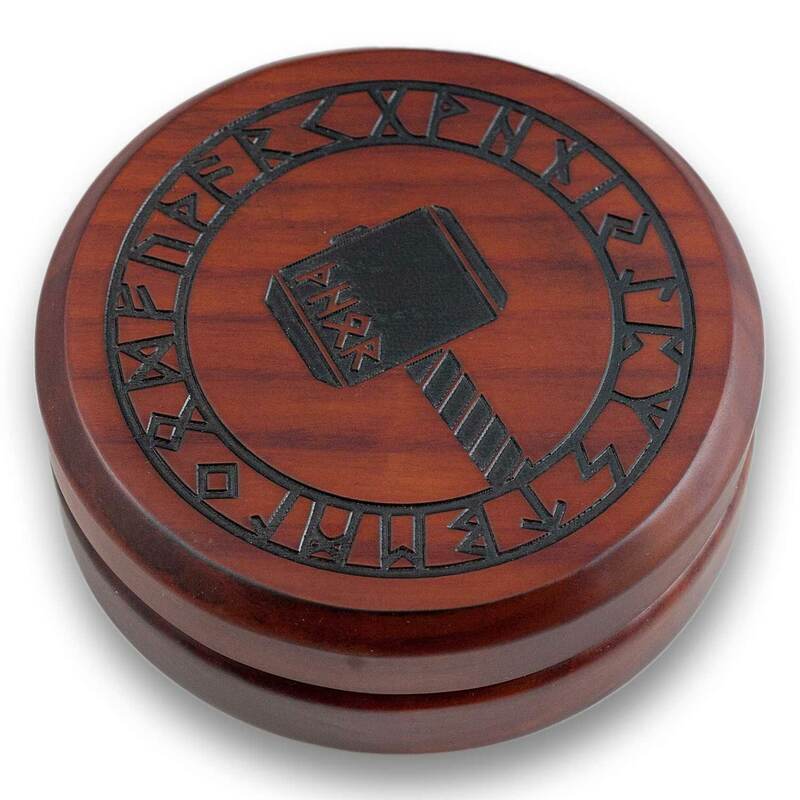 PACKAGING: Housed in a round wooden display box designed with the Mjölnir, the name of Thor’s hammer, surrounded by the Runic alphabet. King Harald Fairhair, the First King of Norway. 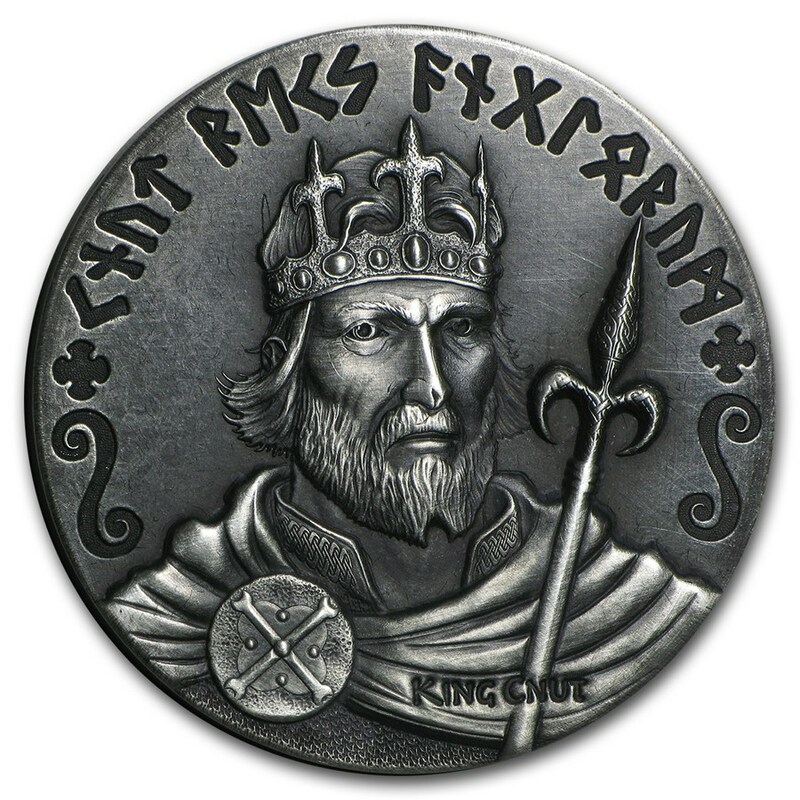 King Fairhair reigned as the First King of Norway from 872 to 930 A.D. 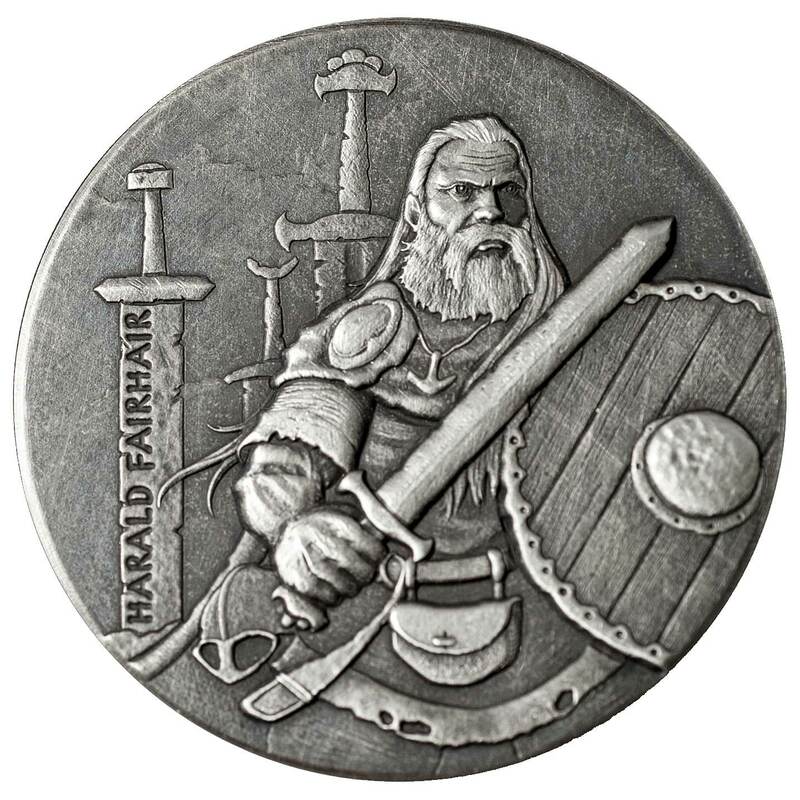 Between 866 and 872, Harald Fairhair conquered many petty kingdoms in what is modern day Norway. King Fairhair’s efforts to crush all opponents to his rule culminated in the great Battle of Hafrsfjord in 872. Legend goes that King Fairhair’s victory on the battlefield that day changed history forever and united all of Norway under one crown, the first King of Norway, Harald Fairhair. DESIGN: Features a mixture of past and present. In 1983, King Olaf V of Norway unveiled in Hafrsfjord, Norway “Sverd i Fjell” or “Swords in the Rock,” a monument of three swords, each standing approximately 10 meters (33 feet) tall, to commemorate King Fairhair’s great victory at the Battle of Hafrsfjord in 872. 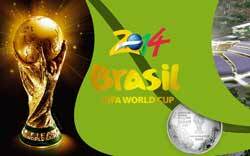 The largest of the three swords represents King Fairhair, the two smaller swords the petty Kings defeated that day. In Scottsdale Mint’s coin, King Fairhair is depicted standing in front of Sverd i Fjell, sword and shield in hand, gazing out over the horizon. 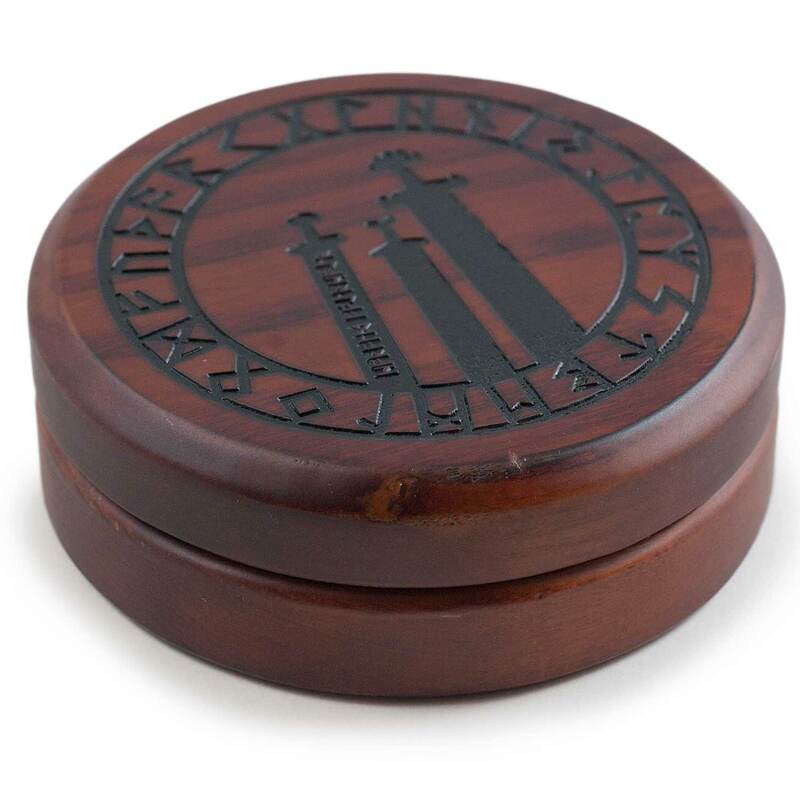 PACKAGING: Housed in a round wooden display box designed with Sverd i Fjell, a monument of three large swords, surrounded by the Runic alphabet. 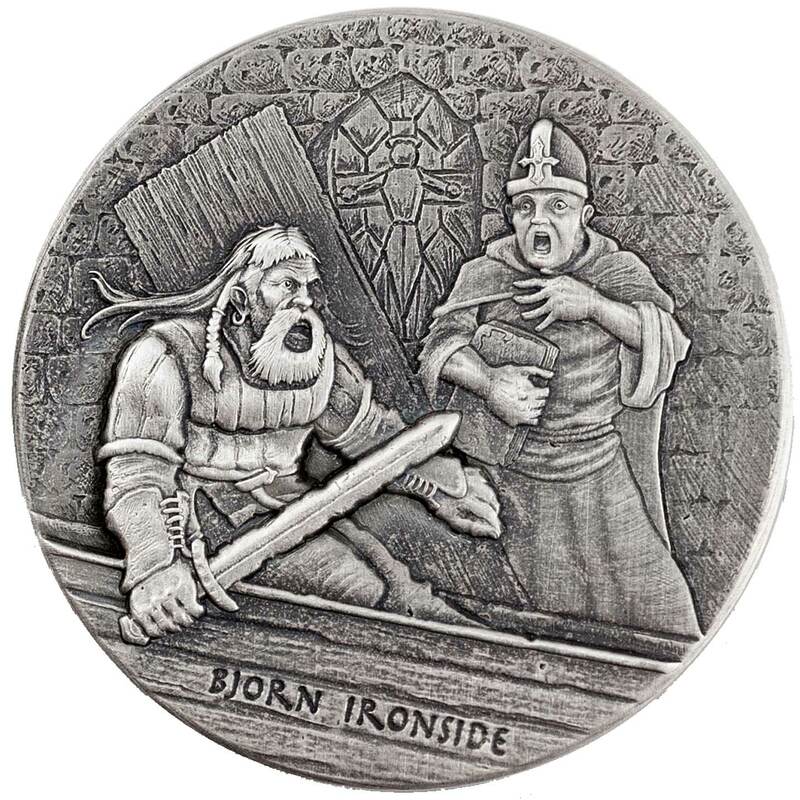 Bjorn Ironside, the son of legendary Viking warrior and King, Ragnar of Lothbrok, is remembered as being a fierce warrior, powerful Viking chieftain and naval commander. Upon Ragnar’s death, Norse legend indicates (although disputed by many) that Bjorn inherited the lands that comprise much of Sweden and Uppsala, becoming the first King of the Munso Dynasty. One of Bjorn’s more notable legendary exploits included having raided France in 860 with his brother Hastein in a continuation of the tradition initiated by their father Ragnar Lothbrok. In 860, Björn led a large Viking raid down the Iberian coast, fought their way through Gibraltar, pillaged the south of France, and ultimately landed in Italy and captured the coastal city of Pisa. 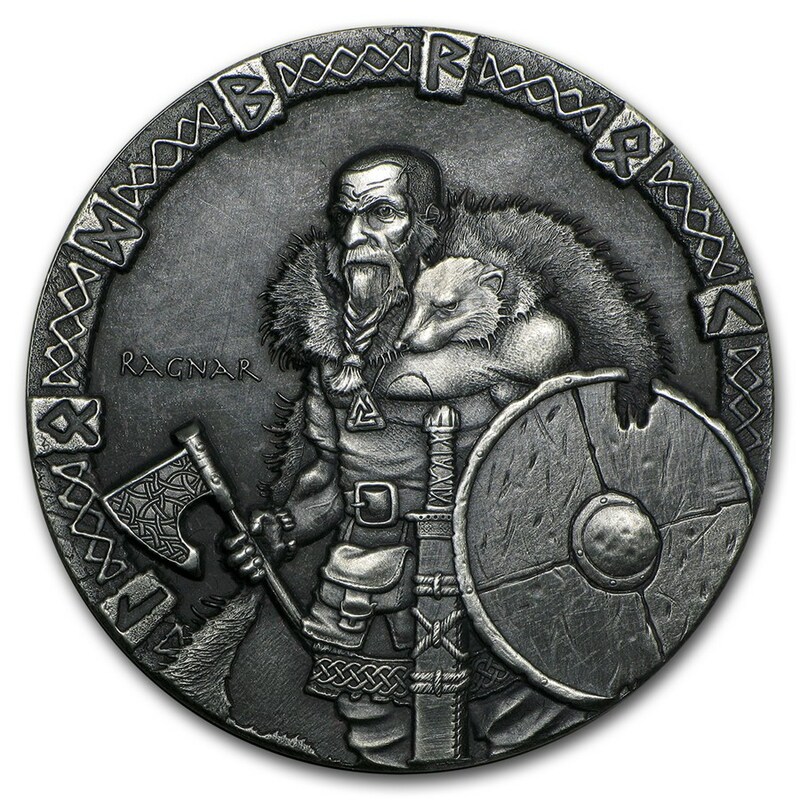 DESIGN: Bjorn’s depiction on the coin is based upon the historical account of his sacking of the town of Luna, Italy, which legend says he believed to be Rome at the time. Unable to breach the town walls by force, Bjorn sent messengers to the resident Bishop of Luna who announced (lied about) Bjorn’s death and last request for a deathbed conversion, and the desire to be buried on consecrated ground within the church. The Bishop, agreeing to Bjorn’s request, permitted Bjorn’s “dead” body entry into the chapel with a small honor guard. To the amazement of the Italian clerics and others in attendance, Bjorn surprised the crowd by bursting from his “coffin” and fighting his way to the town gates to win their eventual freedom, allowing his army entrance to Luna and its riches. 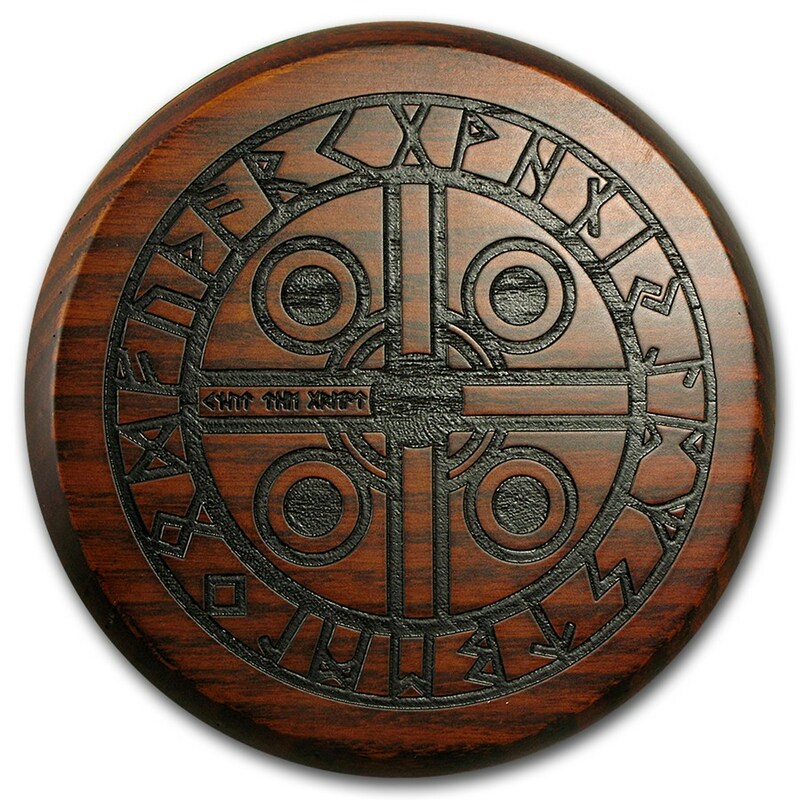 PACKAGING: Housed in a round wooden display box designed with a Norse carving with Fjorn’s name in Runic and is surrounded by the Runic alphabet. As we noted earlier, the coin has its serial number inscribed on the unreeded edge. This is obviously unique to each coin and matches the enclosed Certificate of Authenticity. A nice piece of added security that makes counterfeiting these far less attractive, a valid concern given the proliferation of copies of some of CIT’s early Mongolian Wildlife Protection coins. 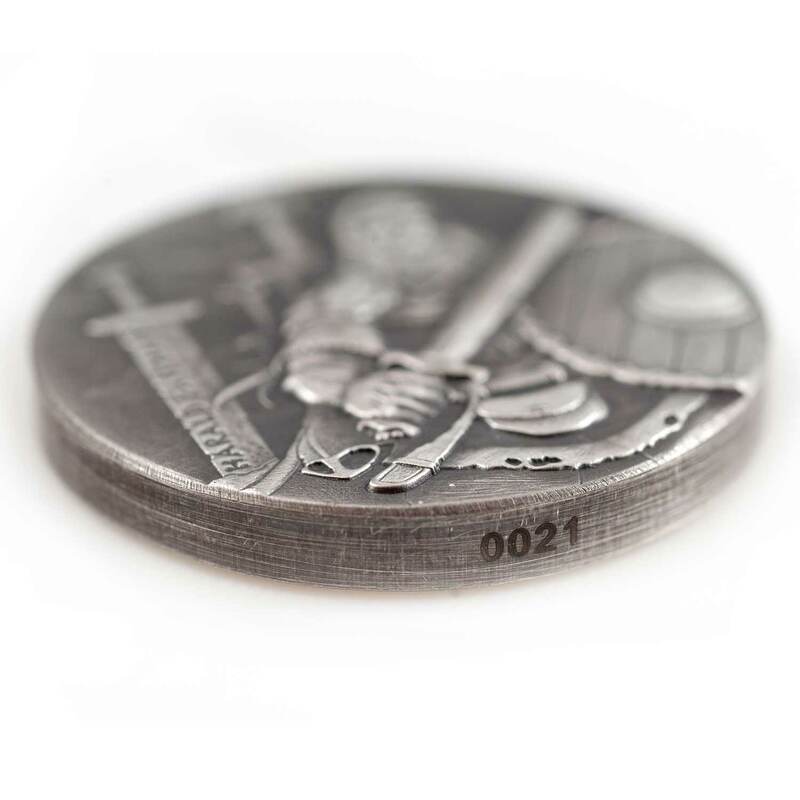 CIT added security to their coins to make life far more difficult for pirates. 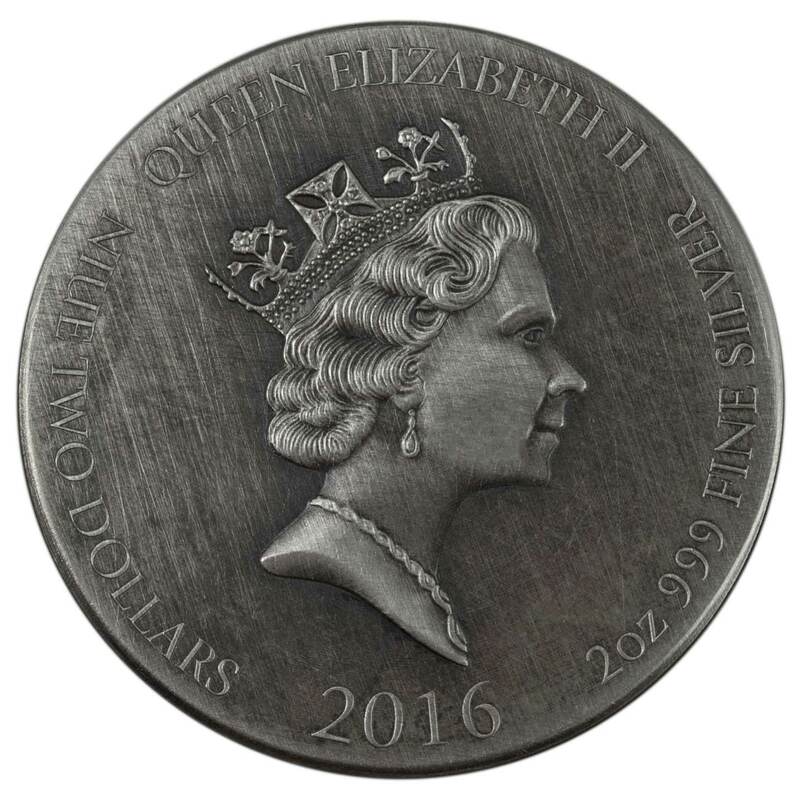 The obverse uses an older effigy of Queen Elizabeth II, the superb Raphael Maklouf version that was supplanted by the very popular Ian Rank Broadley version, now of course itself replaced by Jody Clark’s new one. Inscriptions around the effigy detail her name (QUEEN ELIZABETH II), the coins composition (2oz 999 FINE SILVER), year of issue, and the issuer/denomination (NIUE TWO DOLLARS). It’s also antiqued to an equally high standard. Packaging for this series is some of the very best around. Very similar to that the Perth Mint used for its original two gods series (the Olympus ones), these have the added bonus of wearing custom artwork on the lid, different for each individual coin. It’s a nice touch and the designs are very authentic looking. The design almost looks branded in with a hot iron. 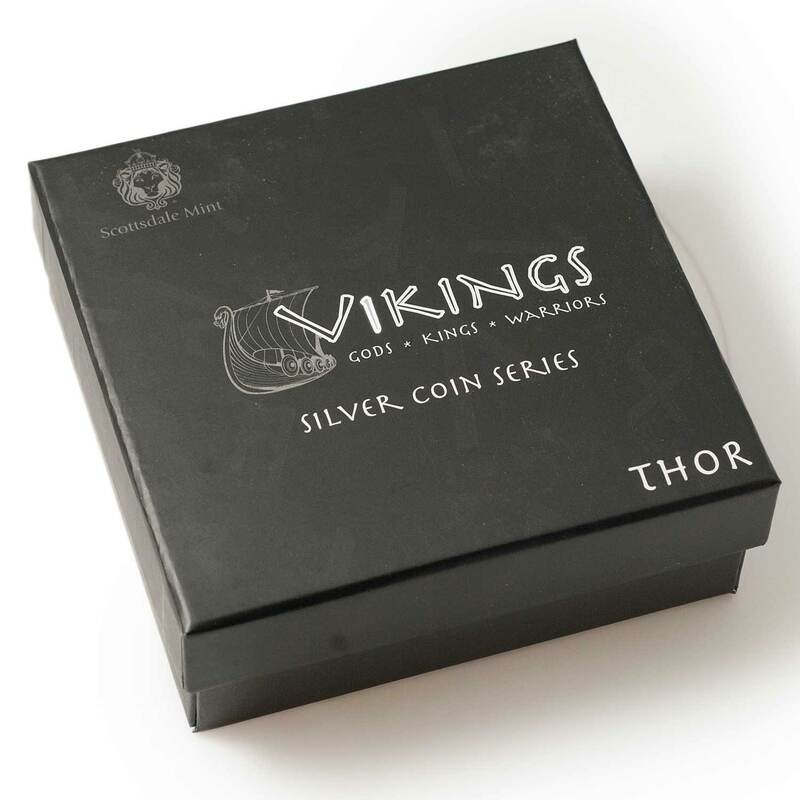 The outer ring of runic symbols stays the same for each coin box, but the inner artwork is themed for each subject – the hammer Mjolnir on the Thor coin box for example. 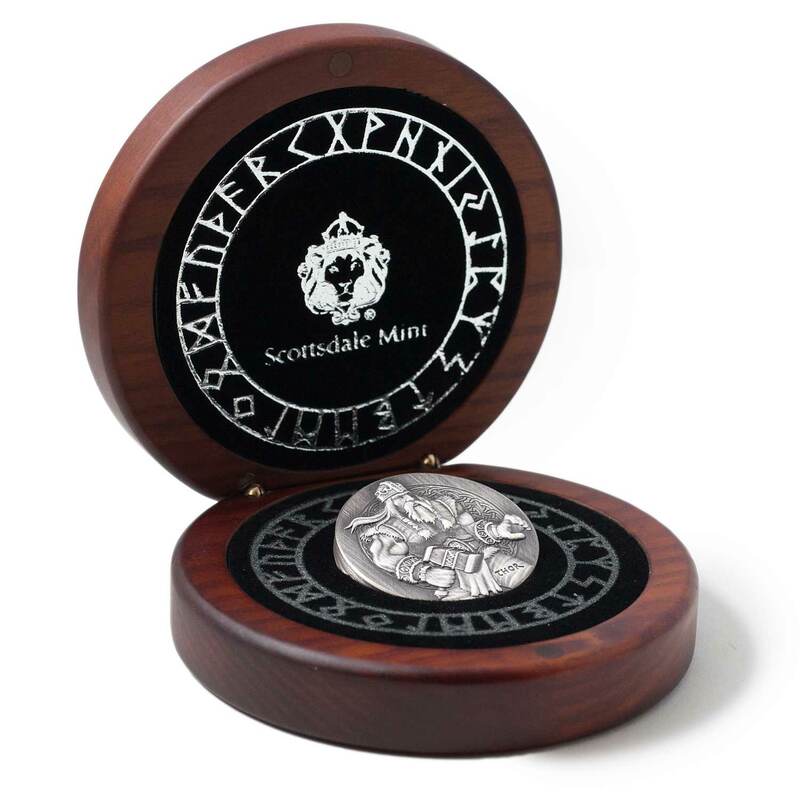 The interior is quite plush looking and carries on the runic symbol theme from the box lid, along with the Scottsdale Mint logo, all highlighted in silver. Each box is placed in a black outer shipper with the series logo on the lid and again, the individual coin name. It seems Scottsdale put some serious thought into the presentation of these.